For the last 5 years CAIDA has hosted the "Active Internet Measurement Systems" workshops, to promote discussion between academics, industry, policymakers, and funding agencies on active Internet measurement, and exchange of research ideas and questions that have been answered, or could be answered with existing or proposed measurement infrastructures. On March 26-27, 2014, CAIDA hosted the 6th workshop on Active Internet Measurements (AIMS-6) supporting science and policy. AIMS 2014 was by invitation only. Registration is closed. This year, we want to explore existing capabilities and potential opportunities for network measurement in the wireless domain, and research infrastructure to support it. One motivation is the increasing attention to measuring the character of broadband access, including the U.S. FCC Measuring Broadband America effort (for both wireline and wireless connectivity). The more complex structure of cellular access, with its signalling protocols and potential to shape different sorts of application traffic, makes it harder to decide what to measure in order to characterize or compare wireless service. what specific questions are being investigated with current wireless measurement research activities? what large-scale data respositories of wireless measurements exist and how are they used? who is funding work in this space? what does the research community need? who can help? how much measurement is occuring internal to commercial networks, for operational purposes or as part of developing new technology? which measurement questions are important to different parts of the ecosystem: carrier, consumer, regulator? what technologies, tools, or activities exist to support monitoring usage of emerging shared spectrum, e.g., whitespaces. how do operators of databases maintaining spectrum utilization information validate their data? how is the data being used or how could it be used? how much validation is happening/possible today? Unlike a traditional workshop where attendees present talks on their work, we will have a series of sessions on the pre-selected topics with presenters preparing short talks and subsequent discussion. Not everyone necessarily gives a talk, but everyone would be expected to participate in the discussions. This format lets us dig deeper into the selected topics so that we can try to develop some consensus on a wireless measurement research agenda that may require concerted infrastructure investment. 08:30 - 09:00 Round of introductions: "What I want to get out of the workshop"
Can we tease apart issues in the air protocols from the provisioning of the access backhaul and other aspects of the access system? What can we say about evolution of performance, and how to best quantify performance? What instrumentation is needed for network monitoring of smart-grids and internet of things? What are the most useful measurement capabilities for spectrum agile devices? How can interactive applications prosper in mobile networks with aggressive traffic shaping policies? How network performance translates to mobile app and mobile web performance? What are the state-of-the-art mobile measurement tools, analysis, techniques, what is progress blocked on? What are the challenges of mobile performance measurement? What databases exist for spectrum utilization? Who maintains them? How are they used? 08:30 - 09:00 Roundtable: "What I learned from the workshop yesterday"
Ann Cox (DHS), What is role of federal government in mobile measurement space? What measurements and instrumentation are needed to support large-scale network performance research? How can funding agencies help with the incentive (to deploy tools) problem? What responsibilities should exist in terms of privacy protection and informed consumer consent in the collection and retention of mobile broadband data? What privacy-preserving data-sharing among/with researchers currently occurs? How should implementable policy be best developed in this area? How can we motivate wireless carrier cooperation? How can we make data easy to digest for users and policymakers? Parking Permits: Parking permits are required to park on UCSD Campus. On arrival to campus on the morning of Day 1, check in with a CAIDA staff member at the small turn-in driveway in front of the stairs of the SDSC building on Hopkins Drive. We will give you a parking permit for the day, and then point you to the Hopkins Parking Structure for parking. After picking up your parking permit, it is recommended you go to the Hopkins Parking Structure next to SDSC and park on the lower levels. Walk back the way you came out of the bottom of the parking garage (level 2), and back to the stairs of the SDSC building. The auditorium is on the left just before the stairs, labeled Auditorium or B210E/B211E Meeting Room. The AIMS 2014 workshop will be held in the SDSC Auditorium. 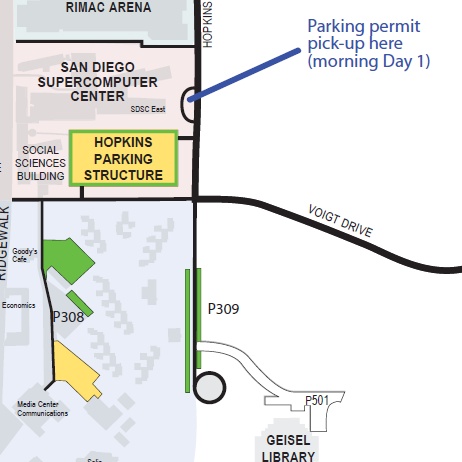 General UCSD Maps and general UCSD Visitor Parking information are useful resources for navigating on campus.